My beautiful friend made everything more FUN. Almost from the moment I met her (pushing baby Mackenzie in a stroller through the IBM break room in building 502) she was a central part of my life. It’s impossible to describe in words alone what she meant to me. So here is a collection of photos to share what I loved about my dearest friend, Carrie Gilmore. We had TONS OF FUN. Birthdays, beer fest, Cake Decorating class, and celebrating a new house (3 or 4 times! )… everything was full of more joy when shared with Carrie. In fact, Jim and I hit the friend jackpot when we met Mark and Carrie Gilmore. I first knew Carrie as a mom. I think she was one of my first local NC friends who had kids. I’m quite a bit YOUNGER, so it makes sense that she’d already started a family when I met her. (I love imagining the face she would flash at me for pointing out that I’m the baby of this group, haha!) She was my #1 stay-at-home-mom role model from the start. When it was my turn, I loved celebrating my pregnancy with Carrie and Dawn, introducing them to my newborn Patrick, and asking a LOT of questions! In the days before Facebook mom groups, Carrie suggested which books I should read and was a reassuring voice of calm advice. She frequently stopped by to interact with the baby she called “PTB” and to provide plenty of welcome adult-friend conversation. When we started hanging out with the Gilmores, they didn’t have family living in the area. We were “like family” as Aunt K and Uncle Jimmy and enjoyed meeting more Gilmores and Holdermans as they visited or moved to the Triangle. It is always fun to include them when our family is in town too. My dad even has a shirt that claims, “I know Mark Gilmore”! Carrie knew how to plan a grand celebration, putting special thought into every detail. She hosted wonderful birthday parties, baby showers, ugly-Christmas-sweater parties, and even our “going away to Louisiana” party. She was a wonderful cook, creative crafter, and talented baker. We celebrated Thanksgiving with fried turkey, celebrated Christmas with trips to the NC Farmers’ Market for fresh trees, and taught the Gilmores about Mardi Gras and KING CAKE. I treasure my memories of hanging out and playing games together: Times Up, Dance Dance Revolution, Zingo, Hedbanz. My friend had a wonderful sense of humor and an amazing laugh. I love that we vacationed to Emerald Isle as a Balhoff-Gilmore-Smith condo. Carrie loved her family fiercely. It was always obvious that her relationships with her husband Mark and her two daughters were her top priority. She was generous, kind, and full of love. I love Carrie’s girls. 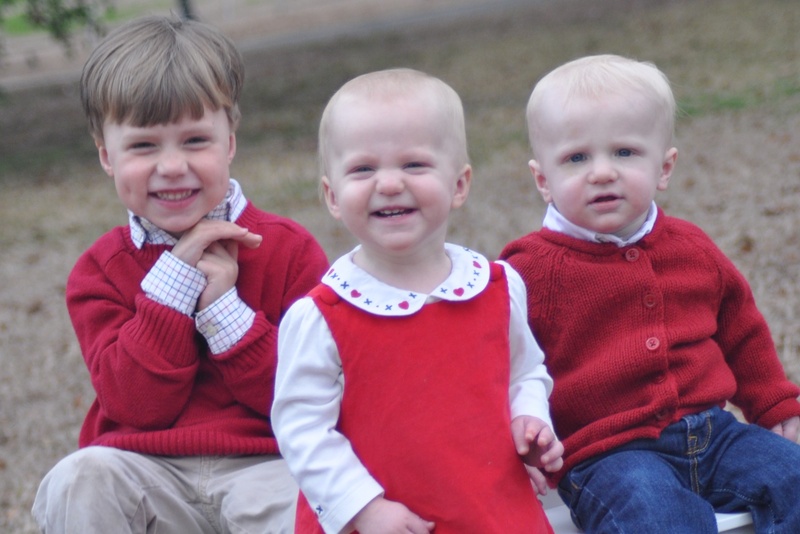 I met them as babies (in fact I stayed home with Mackenzie when it was time for Addy-Boo’s arrival!) and I feel great pride to see them become strong, smart, kind, beautiful young women. 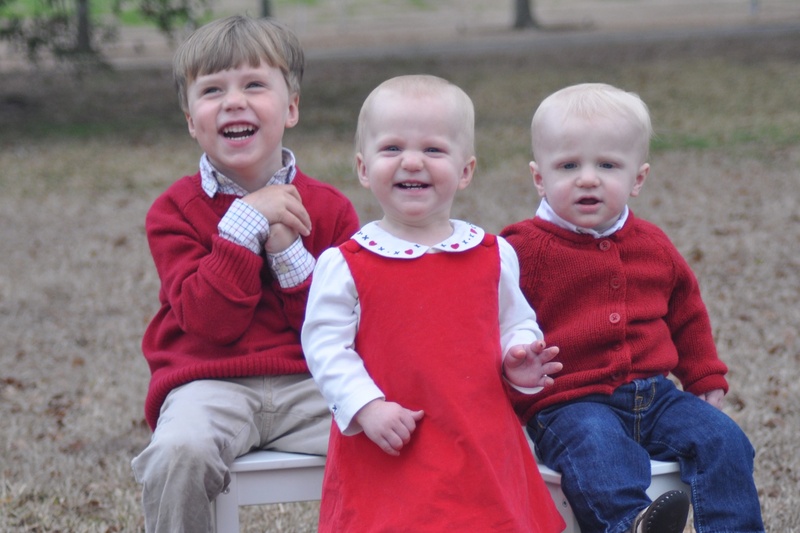 The Gilmore Girls are exceptional role models and a wonderful influence on my kids. I love that our families have many, many, many happy memories we’ve shared together! And I couldn’t be more honored that Mark and Carrie asked ME to be Addyson’s godmother. I adore that Boo! Carrie had endearing nicknames for everyone. I’m sure that many people reading this can imagine her booming voice, greeting them with their own unique nickname. I can “hear” mine as the intro of a sassy voicemail message or in exaggerated disbelief in reaction to any number of ridiculous stories I would share with her for a laugh. It always made me feel special and loved. Speaking of sassy, Carrie made the most expressive, comical faces! I’m not even sure what’s she’s saying with her face in half of these following photos, haha. My favorite expression was the one where she would raise her eyebrows, widen her eyes, and make an “oh my” noise while she inflated her cheeks to their full puffed-out capacity. I wish I had a picture of it, but I can see it clearly in my memory. Can you see it too?! It was usually in reaction to, again, any number of ridiculous stories I would share with her for a laugh. She was a great listener and a supportive ally. Carrie Gilmore had a million-zillion-bagillion beautiful friends. She was an outgoing leader, always meeting new people with her enthusiastic, welcoming personality. Everyone enjoyed spending time with Carrie. Carrie was amazing with kids. She was animated, engaging, and tons of silly fun. She was a wonderful, patient teacher. She was consistent. She was fair. She modeled grace and kindness. She made a real connection with kids, and “Aunt Carrie” could always make mine LAUGH! Carrie didn’t shy away from learning something new or making steady progress towards her goals. We supported each other in adopting healthy habits and accomplished Lifetime status in Weight Watchers together. (I love that we made time to go to those weekly meetings together!) We also had a blast taking a Wilton cake decorating class together. Then she continued classes and turned it into a business! Her cupcakes were creative, beautiful, and delicious. Carrie Gilmore was incredibly generous with her time and talents. She was passionate about our community, and her dedication to “giving back” was unwavering. She touched the lives of so many, many people in a measurable way. Juliellen beautifully summaries her impact in Chapel Hill Magazine, and Carrie’s legacy lives on through the wonderful Girls on the Run Triangle Carrie Gilmore Memorial Fund. I’m so proud of my friend and her amazing accomplishments! Carrie was the ultimate example of the quote she liked, “She who leaves a trail of glitter is never forgotten”. She made everything more festive and fun… often wearing a tutu, her shining smile, and an extra dash of sparkle. My friend Carrie was supportive and understanding. I remember her constant support during the stressful months-long phase of getting a diagnosis and learning that I am a special-needs parent. She listened to my concerns. She encouraged my determination to learn more. She accepted my family without hesitation. As I write this, my friendship with Carrie almost sounds too good to be true, but as the many hundreds and hundreds of people who attended her memorial service and/or wrote a message of gratitude on her Facebook wall can attest… it was the real deal. Carrie was a steadfast source of goodness in my life. My friend was beautiful inside and out. She had resilient strength. She demonstrated ultimate courage… especially while fighting a vicious breast cancer. We would meet up for walks and talks while she was going through treatment. Carrie was incredibly brave in that most vulnerable situation. We shared several important conversations in those months that I’ll never forget. I’m grateful for all of the years that I spent with Carrie, but I think I am most grateful for the afternoon we spent together on April 28, 2016. We visited over take-out salads, we talked about how to draw eyebrows on your own face, we giggled over her hair starting to grow in, and we traded mom stories like we always did. I’m certain that I got to see my favorite facial expression of hers many times during that visit. Her voice sounded a little different, but otherwise it was possible at times to forget that she was even sick. That’s why it was an incredible shock that her health declined very quickly, and she told her family goodbye only four days later. The photo I have with my kids below was taken after I spent my last afternoon with Carrie, so I will always look at it with gratitude for that day. Carrie Gilmore’s memorial service was a beautiful tribute to her life. I could’ve listened to Mark talk about her for hours. I loved that so many friends wore tutus in her honor for the lovely reception that followed. I enjoyed reading each comment about her on the memory wall. She was a true gem of a friend. My heart is bursting with gratitude for all that I am today thanks to her beautiful friendship. I miss her so. I love her more. 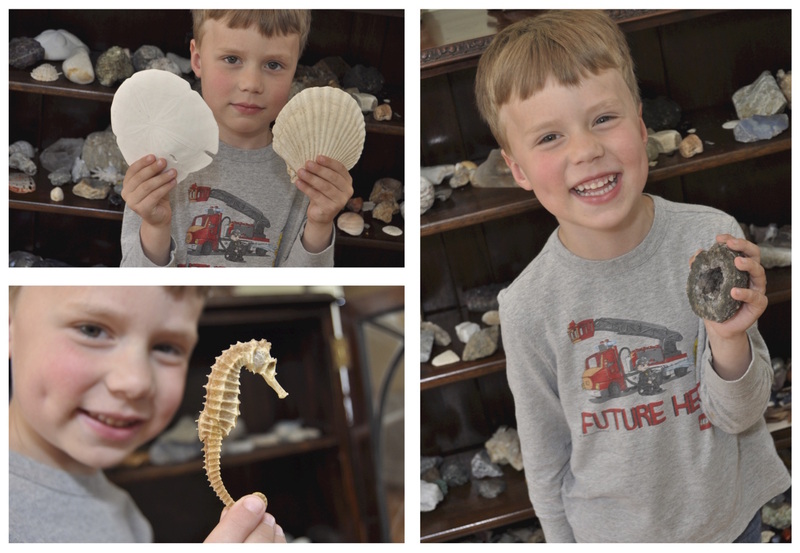 Today I would like to feature a guest post by my favorite Junior Geologist, Patrick. The text that follows in italics are his words. 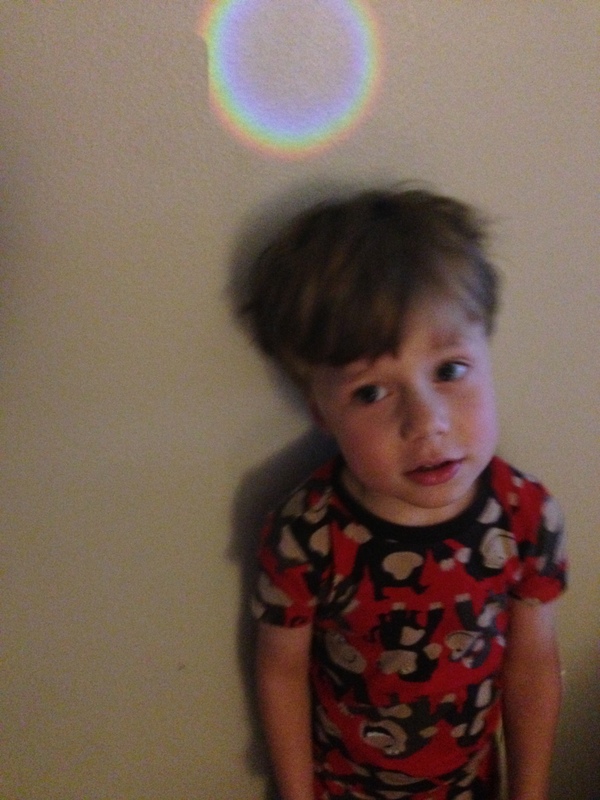 He will describe the fun project we completed while the twins were napping one day. 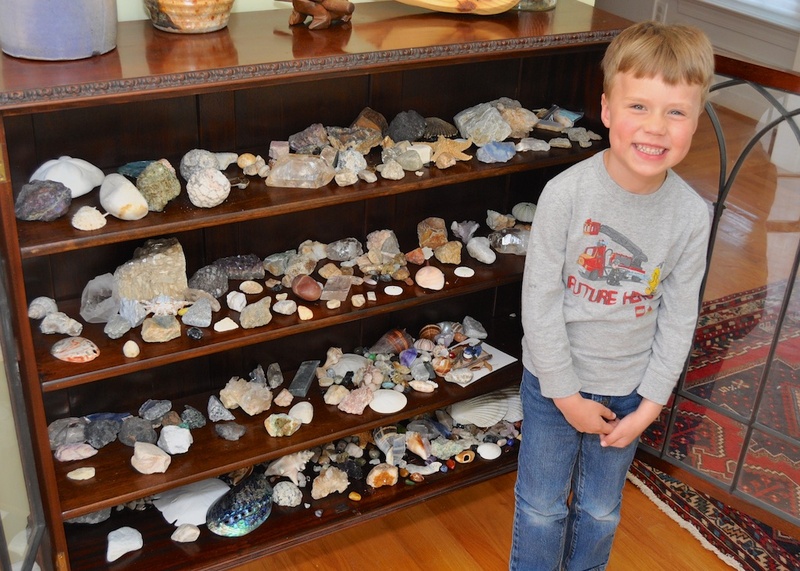 I like to collect these: shells, rocks, and minerals. They are from my great-grandfather and my grandmother. I will miss our Baton Rouge house when we move to North Carolina. Of the three houses we’ve owned, this one is my favorite. The floor plan is a wonderful use of space for us. It has an abundance of natural light (which was *absent* in our last house). The kitchen has a ton of cabinet and counter space, and the closets are spacious. The neighborhood is beautiful; next door is an open field with stately live oaks that has served as my portrait studio for the kiddos. But the funny thing I’ll miss the most? Newgrange in our living room. 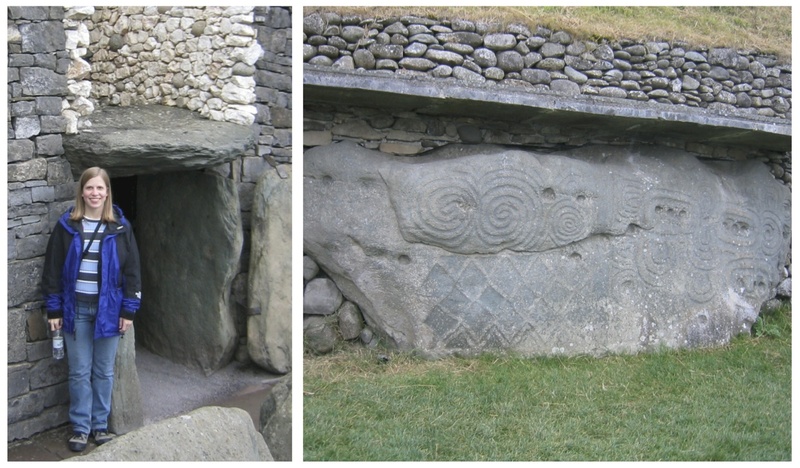 The house has an interesting astronomical feature that we refer to as “Newgrange”. 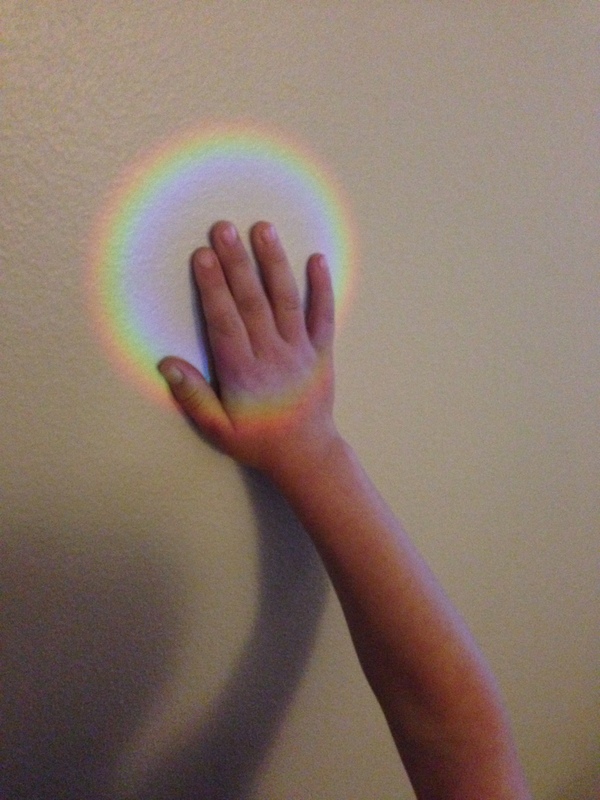 It’s a circle of light that shines on the living room wall at sunrise during certain months of the year. 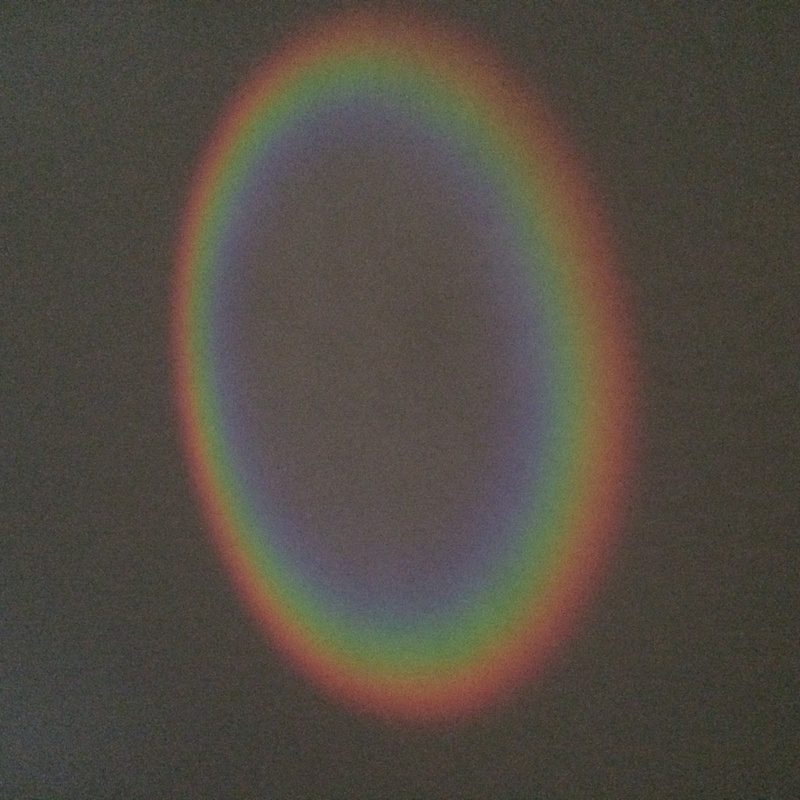 In October and February, the house is positioned just right relative to sunrise that light shines through the peephole on the front door and makes a rainbow circle on the back wall. It’s the perfect height on the wall for Patrick to reach up and touch. It’s fun to be the first person in the house to shout Newgrange! on the sunny mornings that make it possible, especially when we haven’t seen it for a while. 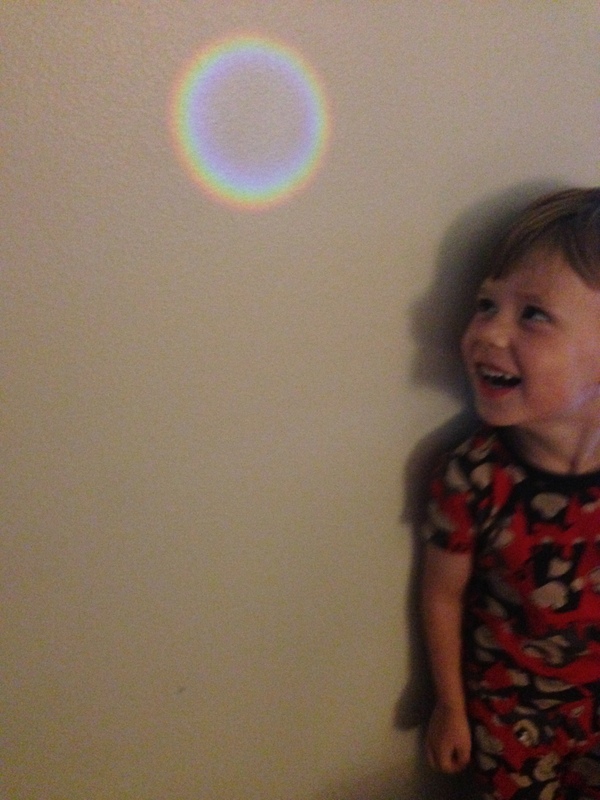 It moves on the wall over time, and I’ve considered charting its path with Patrick as a fun science project. Since we haven’t charted it, I’m not sure that it’s only in October and February. Those are the only months when I have photos of it. Does anyone else have interesting images made by the peephole in your front door? We named ours Newgrange after the 5000-year-old passage tomb built in Ireland which is aligned with sunrise to illuminate the inner chamber for only a few days around winter solstice. 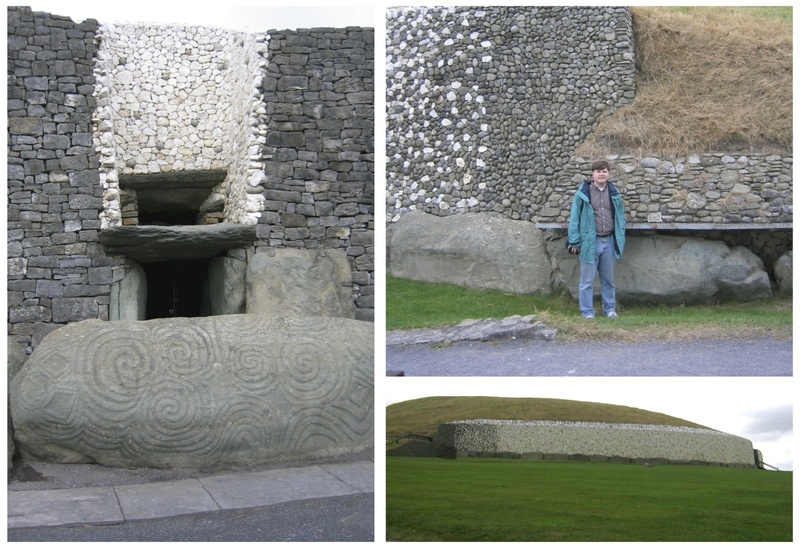 We know about Newgrange (and think it’s a cool feat of Neolithic ingenuity) because we toured the tomb on our 2003 vacation to Ireland. To our friends who will be the next owners of the house, we’re very excited that you will be living here! And feel free to check out this National Geographic – Tomb of Newgrange video and enjoy a fun bit of astronomy in your own living room. Maybe I can recreate something like it in our next house?! The Balhoffs are moving back to North Carolina in 2014! 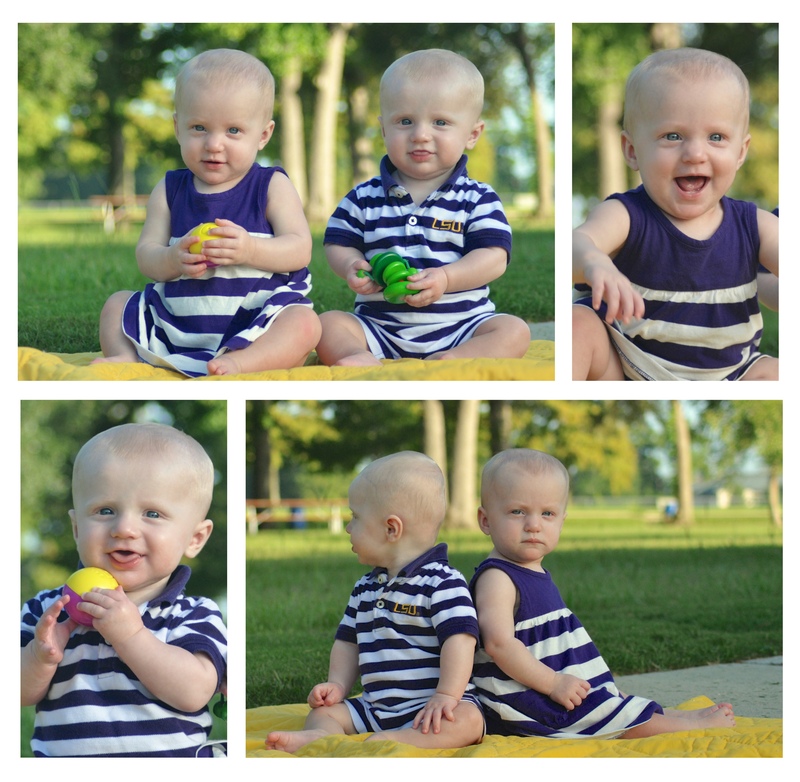 Claire and Edward are 8 months old. I’m cleaning out their closet this week of everything they’ve outgrown, and it’s amazing. We have graduated from infant gear like swings, swaddle blankets, tiny bottles, extra burp cloths, and tiny onesies and pjs. They’re already almost too big for our double Snap-n-Go stroller. The second baby’s feet can’t fit under the first baby’s carseat any more. Since I use it as my cart, I’m not sure how I will grocery shop without it.